The functionality of Content Station is driven by the available Applications. Each Application can be seen as a tool with which a specific task can be performed. Content Station comes with a default set of Applications (such as Search, Upload, Planning), but you can also add additional Applications. Tip: Adding an Application to Content Station makes it readily available and saves you from having to look for it outside of Content Station. As is the case for the default Applications, added Applications can be accessed from the Applications pane on the Home page or from the Tab menu. Figure: Applications are shown in the Applications pane (A) on the Home page. Default icon for Web sites, Enterprise Server instances or the Enterprise My Reporting Application. Instead of this icon, it is also possible to use a custom icon. External Applications are represented by their own icon or a custom icon, such as the icon for InDesign CS6 shown here. Applications are added by defining them between the <Apps> </Apps> tags of the WWSettings.xml file. Adding Elvis 4 or Elvis 5 to Content Station enables you to search and manage all content that is stored within that environment and easily add content from Elvis to Enterprise through drag-and-drop. For more information, see Integrating Elvis 4 in Content Station 9.
icon is the path to a custom icon stored on the server. When not defined, the default icon is used. The icon should be stored in the Enterprise Server directory "/config/images/appicons"
external indicates whether the Web site should be opened within Content Station (value is set to "false" or the value is left out) or in the default Web browser on the system (when the value is set to "true). The My Reporting instance is the default reporting application that is shipped with Enterprise Server. Note: For information, see Working with reports in Content Station 9. The icon should be stored in the Enterprise Server directory "/config/icons/applications"
external indicates whether the report should be opened within Content Station (value is set to "false" or the value is left out) or in the default Web browser on the system (when the value is set to "true). Any application that is installed on the system can be added to Content Station as a shortcut to access that application. Note: Opening installed applications this way requires Enterprise Agent to be running. Application path icon is the path to the icon to appear for the application in the Application pane. In the context of Content Station, the definition of a Flex application is any real application that can also run without Content Station and which runs in its own application domain. Note: In practice, such applications will probably always be Flex applications (as an extension of the mx.Application), but they can also be build up from pure actionscript (without the Flex framework) or be a exported from an .fla file in Flash. They cannot access most stage properties, methods, and events. They cannot get mouse and keyboard events from other Security Domains. They cannot perform drag-and-drop operations to or from Content Station when in sandbox mode. Dialog boxes are clipped at the boundaries of the application. If the application uses any of the AIR API’s it will not run in Content Station Web. Flex applications must be build as a SWF file. Data sharing between Content Station and the Flex application requires marshaling. Flex applications loaded from a http location can only run in sandbox mode, except when installed through the Server plug-in (as opposed to a manual installation, see Installation). The Flex application should check whether the correct runtime is installed. The Application Descriptor file (loaded by Content Station on startup) should note the AIR SDK used or “none” if there is no AIR dependency. Flex applications use the Content Station application folder as the base path. Use the API to retrieve the module base path. This path can be used to resolve paths to other files that the Flex application may need. Flex applications can be configured to load in their own Security Domain (sandboxed). A Flex application can have multiple instances running at the same time. This can be defined during installation. Content Station AIR has a minimum size of 960x600 pixels for showing the application in its own tab, leaving a minimum size for the application of 783x474 pixels. For larger screen sizes take into account that Content Station uses 187 pixels in width and 88 pixels in height around the application tab. Applications can use the canvas of this tab to lay out their user interface elements. We advise to use sandboxed mode because this ensures the maximum amount of compatibility and it offers the most consistent configuration between Mac OS and Windows. 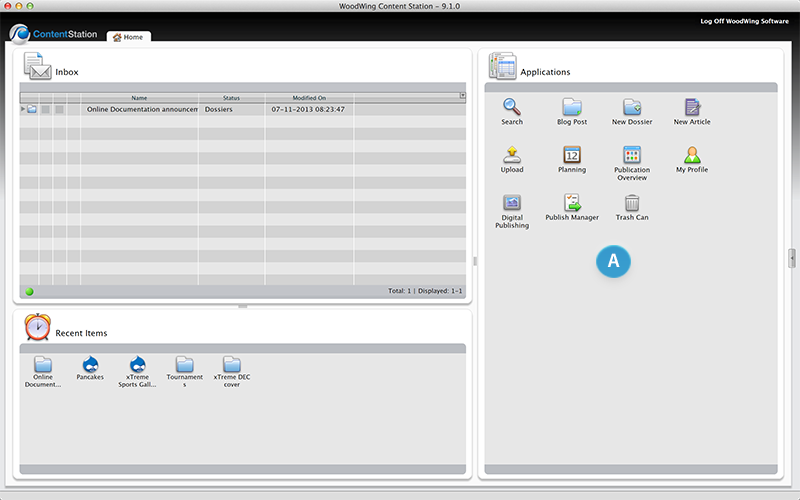 In sandboxed mode the Flex application is completely separated from Content Station. In none-sandboxed mode the use of Flex applications can be problematic when using RPC in combination with proxy servers. The only exception which requires the use of the none-sandboxed mode is if you need to use AIR functions. Content Station Web cannot load a sandboxed Flex application from the same URL. The match is done on domain name, so this can be circumvented by using the IP address instead of the host name. Content Station Web cannot load a sandboxed Flex application from the same server. Note: For more information about the Application Descriptor file, see the template in the module samples. <!-- sandbox is a true/false variable which indicates the security domain. When enabled, the Server plug-in can download the application and make it available for the user by adding an icon to the Application pane on the Home page. This action is performed when the user logs in to Enterprise Server with Content Station. A demo plug-in named "AddSubApplication" is shipped with Enterprise Server through which the process can be controlled. ID . The ID of the application. This ID has to be unique. Version. The current version of the application. This can be used to upgrade or downgrade the application upon login. ApplicationIcon is the icon shown in the Application pane on the Home page. For the optimal result, use a file in JPEG, PNG, GIF, or SWF format in a size of 32x32 pixels. Tabicon is the icon shown in the tab when the application is opened. For the optimal result, use a file in JPEG, PNG, GIF, or SWF format in a size of 16x16 pixels. The SWF file, icons and any other assets that the application might need should link to existing resources on a server. The paths to these resources can be absolute or relative. If they are defined as relative the location of the XML file is used together with the relative path to the resource. For Content Station AIR, the resources will be downloaded upon login and placed in the local storage of the application. This way when another user logs in with the same access rights, the resources do not have to be downloaded again. When the version of the application changes in the Server plug-in, Content Station will always redownload the application. For Content Station Web, the applications are linked from the location defined in the config.xml file. Content Station Web cannot download the resources and place them in the local storage due to access rights of the Web browser and the operating system. DisplayName is the name of the application as it will appear in the Application pane on the Home page and in the application tab. No maximum length exists but it is best to use no more than 25 characters. ClientAppName is the client application for which the application is registered. Note: For more information about the config.xml file, see the config.xml file in the Samples. It explains the usage of each tag. Locally on the user’s system. Globally by copying it to a folder on the same system where Enterprise Server is installed. Note: This location should be the same location as where the Application Descriptor file is stored. Step 2. Make an icon available (for instance in one of the Enterprise Server folders) for showing the application on the Home pane. Use a file in JPEG, PNG, GIF, or SWF format in a size of 32x32 pixels. Name. Name of the application as it will appear in the Application pane on the Home page and in the Tabs menu. Tip: No maximum length exists but it is best to use no more than 25 characters. applicationDescriptor: Path to the Application Descriptor file. icon: Path to the icon file. Allow multiple instances. Define whether multiple instances of the application can be run at the same time. The method of entering the various paths differs by operating system and on which version of Content Station is used (Content Station AIR or Content Station Web) as shown by the examples below. The paths to the Application Descriptor file and the application icon should start with file:/. Both paths are absolute paths. The path to the Application Descriptor file is an absolute path and should start with “app:/”. Spaces in the path name are not allowed. The path to the application icon is an absolute path and should start with “file:/”. The path to the application icon is an absolute path and should start with “file://”. Note the use of the double forward slash "//". The path to the Application Descriptor file is a path relative to where Content Station is installed and it must be within the Content Station application folder. Example: If Content Station was installed in C:/Program Files/Content Station/, this WWSettings link will search in C:/Program Files/Content Station/modules/applicationDescriptor.xml. Note: When upgrading Content Station, the application is removed. It is not possible to use a non-sandbox application from a URL. In this case the application will switch to sandbox mode. Use an absolute path or relative path to point to your Application Descriptor file. The relative path starts at the folder of WWSettings.xml on your server. Content Station Web can only load XML files and applications from the server, so make sure that they are located there. The example above loads the descriptor file from the root of your "server/config/modules/applicationDescriptor.xml". The icon should also be located on your server. Loading a sandboxed application from the same domain is not possible. The "sandbox" parameter will be ignored here. Use an absolute path to point to your Application Descriptor file and point it to another server than the one on which Content Station Web is running on. The crossdomain.xml file needs to be at the same root as the Server where the application is placed. Example: If your server is in "/Applications/Mamps/htdocs/Enterprise8", your crossdomain.xml should be found in "/Applications/Mamps/htdocs/crossdomain.xml". If Content Station Web is running in localhost and your application is on the same Server, you can use the IP address to access the Application Descriptor file. Make sure that you have declared the server in the WWSettings.xml file as "http://localhost/<server name>" and that you have the crossdomain.xml file on the root. The sandbox parameter can be set to true or false.